Just 3 minutes from Charlottesville Airport and 19 minutes from the Downtown Mall, The Pond House is located in a beautiful subdivision called Bedford Hills. Fully furnished and equipped 650 square foot apartment with Queen size bed and sleeper sofa (also Queen size); accommodates 4 adults. Full kitchen with stove, all utensils and dishes, refrigerator and microwave. Beautiful, Tiled bathroom with unique lighting. Flat screen (50 inch) smart TV with cable and Netflix, robust wi-fi. Private entrance, 1 flight of stairs down. Maria and I have been married 50 years. We have 7 children, 4 daughters and 3 sons. I recently retired from a long career in Information Technology. Maria loves to travel and dance. I love Maria and so I travel and dance also! Originally from Philadelphia, Pennsylvania, we moved to Charlottesville, Virginia in 2003 to be with all our kids. Fully tiled, Open circular shower with unique lighting, Vessel Sink, Roomy, quiet exhaust fan with timer, indirect lighting. I accidentally stated one guest would be arriving and when 4 piled out of the car, John sprung into action and got the second bed set up for us. Clean spot with everything you need. We left a few items and John contacted me to let me know. 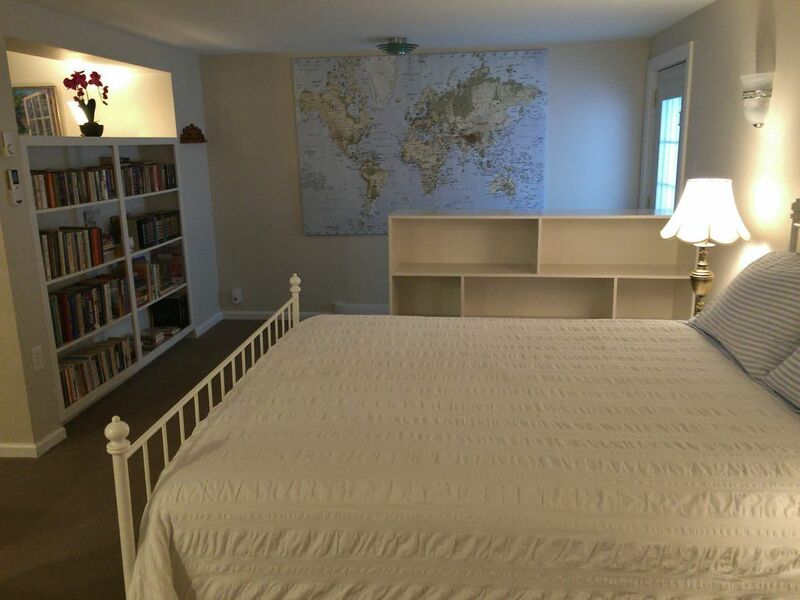 Nice well appointed basement room. Clean, quiet, was great for my quick stay in Charlottesville. We enjoyed our stay at "The Pond House" Spacious, clean, quiet, comfortable and close to all attractions in Charlottesville even though it,s located out in the country. We stayed for the Friday UVA football game. Arrived in the afternoon and napped until time for the game. There is an electric fireplace on the wall which created a cozy ambiance for a chilly rainy day. There is a full kitchen with a large countertop height bar & 3 bar stools. The spacious bath has an awsome shower, but no bathtub. The price of our stay was very reasonable. I would suggest the owners add a chair to sit on for putting on your shoes. Owner is a very nice man and keeps a nice place. Shower is the best I've ever experienced. If you're are in the Monticello area this is the place. Terrific place to stay in Charlottesville. Clean and comfortable with all the conveniences needed for a vacation. I would recommend it ! Very clean and comfortable. Would come again!